Adobe has announced the public beta of Adobe Photoshop Lightroom 4, which will be available as a free download to help test the latest version of the software. Lightroom is a workflow solution favoured by photographers looking to quickly import, manage and make enhancements to images, without needing the full functionality of Photoshop. Each time a new version is announced, Adobe makes it available for public beta, enabling users to try it out and put the new product through its paces before it becomes available as a full product. Photoshop Lightroom 4 has a number of new features, including all-new basic tonal adjustment controls to extract the entire dynamic range from cameras for fine shadow details and highlights. Additional controls for Noise Reduction, Moire and White Balance have also been included. Video support is now included to give photographers with video functionality the ability to play, edit and extract frames from video clips. Many standard Lightroom image adjustment controls can also be applied to video clips. Edited videos can be exported as an H.264 file, or published directly to social networking sites such as Facebook and Flickr. The beta also includes the ability to create photo books with text controls and a variety of easy-to-use templates, as well as a direct link for photo book creation from within the new Book module. A new intuitive Map module displays images assigned with a location, as well as providing tagging controls and saved locations for quick tagging of often visited locations. Soft proofing has been added to the Develop module, which helps photographers ensure correct colours for both prints and web content. Additionally, users can now email images directly from Lightroom using accounts from several different providers including Gmail, Hotmail and Yahoo Mail. 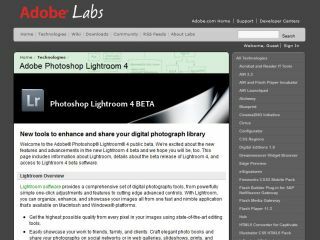 Adobe Photoshop Lightroom 4 beta is available immediately as a free download for both Windows and Mac, with customers able to give feedback at a designated site or via Facebook, Twitter or the Adobe Lightroom blog.